Dearfoams Large Size 9-10 Velour Upper Clog Slipper. Hard sole cushioned slippers. Indoor outdoor soles. Multi Density cushioning system. Color is a deep blue. Machine washable. Large is US shoe size 9 to 10. They're black and grey color. New slippers. Looking really cool. Very comfortable and warm for home use found them at a great price so get them today! Brown Fabric with Faux Animal Print Trim. Dearfoams S Small Quilted Velour Upper Clog Slipper. Hard sole cushioned slippers. Small is shoe size 5 to 6. Machine washable. Color is a deep black. Multi Density cushioning system. 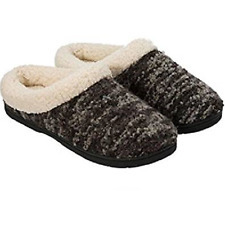 Dearfoams Large (9-10) Velour Terry Clog Slipper. Hard sole cushioned slippers. Large is shoe size 9 to 10. Machine washable. YOU WILL GET WHAT YOU SEE IN THE PICTURES. MULTI-DENSITY CUSHIONING SYSTEM - SLIP RESISTANT - INDOOR/OUTDOOR SOLES. You can wear these in or outdoors. Perfect as they. Sole: 100% Thermoplastic-Rubber Machine Wash Cold Water. Shoe Lining Material: Polyester. Large 9-10. XL 11-12.